Later, I worked on the Danger Quest alien city, primarily adding detail to the large surfaces to add visual interest. These detail parts, affectionately known as "nurnies" and "greebles" in the industry, can be made of almost anything that has the appropriate scale and shape; however, model kit parts were their most common source. This photo was shot by the Introvision camera crew. Note the atmospheric effect. In miniature photography, it was common to use smoke in an enclosed stage, usually beekeeper smoke, to give a sense of depth and scale. 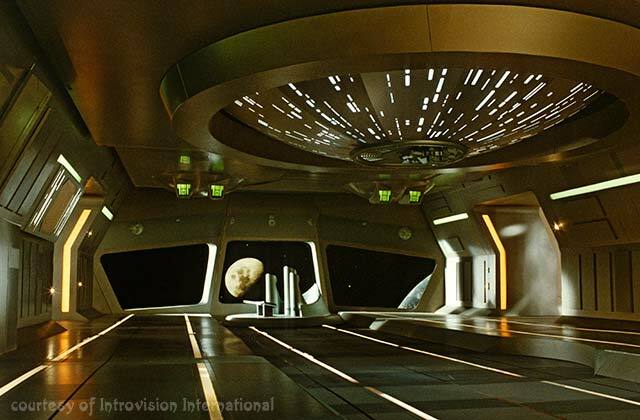 This alien spaceship interior was created at Introvision for The Greatest American Heroine, a 1986 superhero TV special. 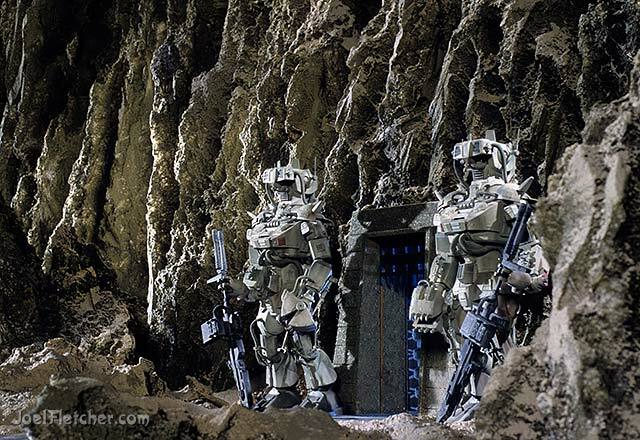 I was a member of a small team who fabricated the model under the direction of production designer Anton Tremblay. Anton's approach utilized clean shape and form -- no greebles on this spaceship! The main materials used were sheet plastic and masonite over wood framing, and the interior had many motorized moving parts. The circular ceiling unit was designed to spin and the command center chairs were able to slide along a track. Many other components were operational as well. The Earth and Moon were projected from behind the windows. 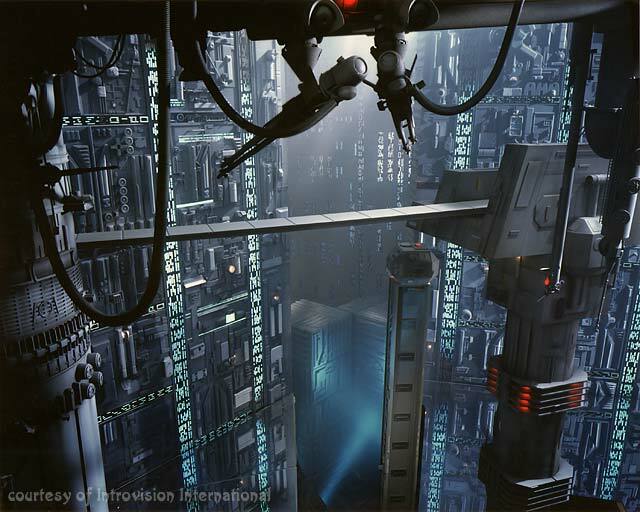 The film's actors were ultimately composited into the scene by the Introvision front projections system. 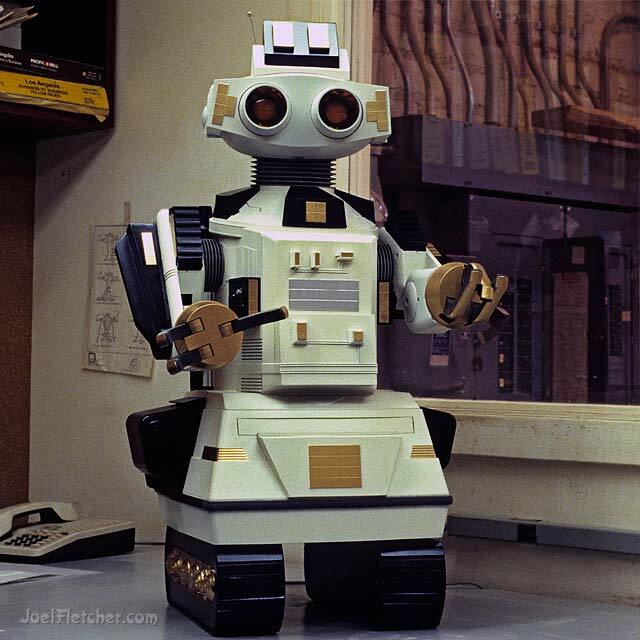 In 1986, I worked on several projects, including this robot, at model and prop company Cinnabar. (To their credit, Cinnabar is still in business to this day.) We started out with a toy radio-controlled robot and basically covered it over with custom components to give it a unique new look. After all of these years, I cannot remember what it was made for or who the client was. 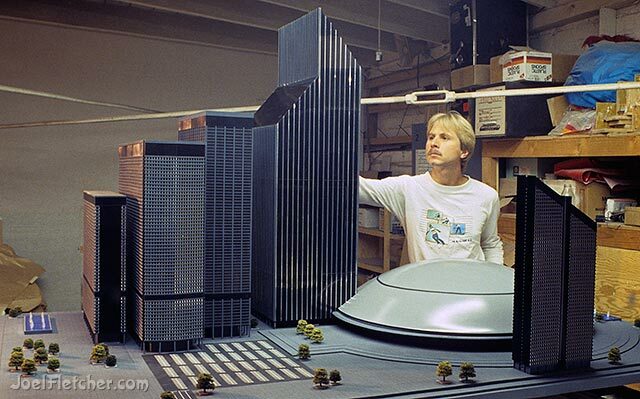 The biggest project I worked on at Cinnabar was an architectural model for the feature film Batteries Not Included. The film's story centered on an apartment building under threat from a big property development. This model was to be shown in the offices of the "evil" developers in order to illustrate their dastardly plans. Paul Bivens and I completed the majority of the construction along with our supervisor Mimi (can't remember her last name). The buildings were made of plexiglass, which was a challenge to work with because all of the seams had to be perfect. No gaps or cracks could be filled and no paint was allowed. It was interesting to create a model that was supposed to be an actual model for a movie, particularly since miniatures were generally used to represent the real thing. Read part 2 and part 3 of Making Models and Props.